Due to the fact that the longer, more "exotic" cruises are booking up way in advance now, we have found that you need to book about a year in advance in order to get the cabin you want (and at a good price!). 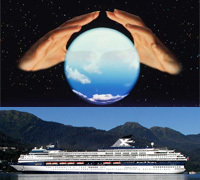 Several cruises we have been on have sold out quickly, with the prices rising as well. Fortunately the cruise deposit is relatively small, and it is fully refundable up until final payment is due (usually about 2 months before sailing). So, we have put down deposits on cruises we would like to take, but will decide later if we will cancel any of them or transfer the deposit to other cruises. The following are cruises we currently have deposits on. We have never done a Norwegian cruise before, so Marjorie picked this cruise because the ship looked interesting. She was kind of thinking of it as a family cruise, but that may not work out. Lynn and John are currently booked with us.